Kenmore washer 70 series. My washer will fill up with water, but will not wash. You can manually turn the dial to spin and get it to spin out; however it will not complete a wash cycle. Could this be a timer problem or something else? It could be a timer problem, but I usually find the culprit is a bad water level control switch (also called a pressure switch or a fill switch). Look at this simplified schematic of the circuit in your washer that controls fill and agitate. You’ll notice that both the timer and the fill switch are involved in this action. I would start troubleshooting at the fill switch and make sure it’s doing its job by switching over from fill to run mode once the water level in the tub is reached. You can do this as either a continuity test with the machine unplugged or a voltage test with power applied to the circuit–your choice depending on your comfort with electricity. More help on making electrical tests here. The wiring diagram for your washer will show the exact terminals and wires to check. If you’re still confused, post your question in the repair forum. 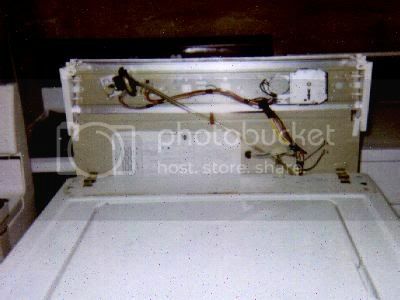 This entry was posted in Washer Repair on May 29, 2003 by Samurai Appliance Repair Man.